Beyond the academics of the Feinberg MD Program, our students are encouraged to engage and network with each other as well as faculty and the community. The colleges at the Feinberg School of Medicine provide each student with a familiar social and academic community that lasts throughout medical school. Under the leadership of a college mentor, approximately 44 students develop trust and help one another learn and adapt to the culture of medicine. 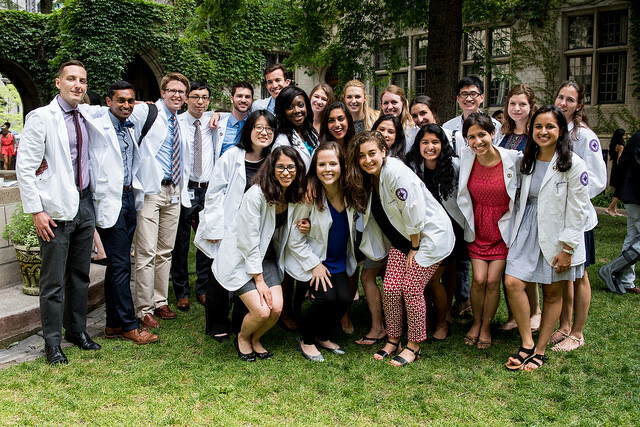 The societies at the Feinberg School of Medicine link colleges across the four years of medical school, connecting students in a network of faculty and fellow students with varying interests and levels of experience. Societies provide students with a broad range of resources for learning, advising, support, and community engagement. Outside of the colleges and societies, our students also participate in a number of student groups based on social and academic interests, career goals, and more. Find student group contact information, Student Senate minutes, and other Feinberg MD information via our secured MD Student section. You’ll need your NetID and password to log in. The Augusta Webster, MD, Office of Medical Education is charged with supporting students and faculty of Northwestern University Feinberg School of Medicine. Learn more about AWOME's leadership and connect with our staff. Connect with established interest groups via the Career Development section.